Only 9 left in stock - Order today! The EuroCave Chamber Wine Cellar comes standard with 1 fixed shelf, 1 rolling shelf, and 3 adjustable shelves all made of solid beechwood. Additional adjustable shelves will allow you to customize your wine cellar. This shelf is designed exclusively for the EuroCave Chamber Wine Cellar. The EuroCave Chamber Wine Cellar comes standard with 1 fixed shelf, 1 rolling shelf, and 3 adjustable shelves all made of solid beechwood. Additional adjustable shelves will allow you to customize your wine cellar. *Capacity is based off using standard 750 mL size bottles, using larger Pinot Noir/Rhone size bottles may limit the capacity. If you would like to store larger bottles you can easily adjust the height of any of the shelves. Additional shelves will lower capacity. 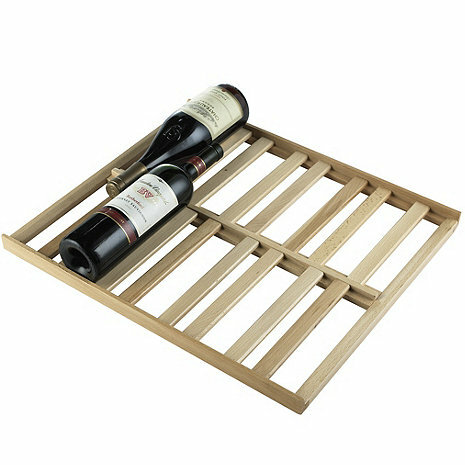 will these shelves fit the EuroCave ArteVino 200 btl cellar sold at Costco. if not, what shelf can i purchase that fits. They will not. The shelf item number you are looking for is 2498933X. Please contact one of our Wine Cellar Specialists @ 1-800-356-8466 to place an order or if you have any questions? what are the dimensions of the self? BEST ANSWER: I think the product specs should have the answer to your question. That said, I measured my shelf: the depth is 17 1/2 inches; width 20 inches and the height of the facing piece is about one inch. In ADDITION TO the included shelving (1 fixed, 1 adjustable and 3 rolling), HOW MANY MORE rolling shelves can be installed. Thank you. Are these available in Sapele? BEST ANSWER: Im sorry no the wine chamber shelving is not available in Sapele. Will this fit in my Eurocave V101? 2494501X. You can always give us a call @ 1-800-356-8466 to confirm. Functional but extremely overpriced. I'm not thrilled with the Eurocave Chamber.